As countries worldwide are struggling to fight the menace of fake news, there seems to be no dearth of a fresh onslaught of baseless, factless news and the people propagating it. Today, The Print ran another of such fake-stories. 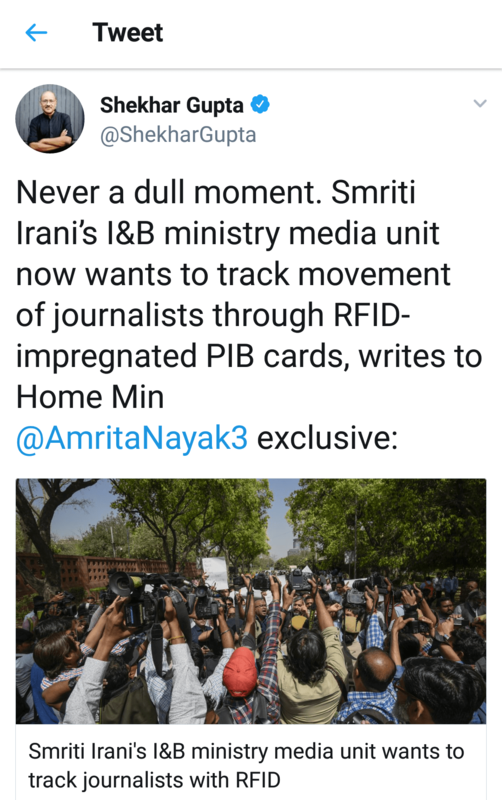 The article published today claimed that I&B Minister Smriti Irani wants to track the movement of journalists through RFID cards. The article went ahead to claim that the Press Information Bureau is working to issue Radio Frequency Identification Cards (RFID) to journalists. The article also mentioned that Frank Noronha, the Principal-Director General of the PIB had confirmed the move. It claimed that The Print has communicated with Noronha and received a reply from him and Noronha, in his response, has stated that the proposal has not been implemented yet. Shekhar Gupta of the ‘coup story’ fame, who is the Print’s founder, shared the story with a ‘never a dull moment’ addition to his tweet. Shekhar Gupta’s claim, however, was promptly refuted by Frank Noronha himself. The Principal Spokesperson of the government of India and Principal Director General of the PIB, in his tweet in response to Shekhar Gupta’s story, stated the story as completely false and called it an ‘outright figment of imagination’. Shekhar Gupta has not offered any explanations so far. Interestingly, the article in question does not even present any documentary evidence for their claim. They have not shared and references or added any proof, they just attribute their information to ‘sources’ and the proclaimed communications with Frank Noronha are not substantiated by evidence either. Shekhar Gupta is famous for identifying the religion and castes of objects from food plates to toilets. The Print didn’t even hesitate in spinning sensational lies about Chinese aggression at Doklam, that could potentially hurt national security. This time though, his imaginations seem to have reached the realms of science fiction.